I have been treating this 45 year old woman for about a year. For the previous year she had been treated with pulsed, low dose antibiotics prescribed by another physician. She sought my help because she was not feeling better. She was well until 2010. At that time she had a tick bite and bull’s eye rash. Because the Lyme test and even a skin biopsy were negative she was told she did not have Lyme disease. Her symptoms started atypically with abdominal pain and sinusitis. Early on she experienced a loss of sense of smell. After this she developed more typical symptoms, cognitive issues, dizziness and hyperaccusis (extreme sensitivity to loud sounds). An MRI of her brain showed white matter disease. The diagnosis of MS was considered and dismissed. She developed palpitation but had a negative cardiac workup. In 2012 her previous physician diagnosed Lyme on clinical grounds. Western Blot testing for Lyme by various laboratories, including IgeneX was negative. She did however test positive through Pharmasan Labs on the ISpot test for Lyme. Coinfection testing was also negative. At the time I saw her previous antibiotic therapy had included: Omnicef, Mycobutin, Minocin, Biaxin and Flagyl. She had stopped antibiotics because of a lack of improvement. When we met chief complaints included: fatigue, nausea, vertigo, weakness, migratory joint pain, numbness and tingling and cognitive impairment. She also reported flulike symptoms with fevers and chills. She experienced low grade, daily, low grade fevers of 99.5 to 100 F. She was treated for chronic depression with medicine which was effective. She was worked as a professional writer, was functioning poorly and ultimately took a leave from work. Over the ensuing months Lyme was the working diagnosis. I treated her aggressively with a variety of antibiotics beyond those already prescribed. I treated her for coinfections. Including Babesia with Mepron and Malarone. Ultimately she did not improve. Over time the diagnosis of chronic fatigue syndrome was added to the top of her problem list. Viral causes were considered and she was treated with months of antiviral therapy; nothing helped substantially. During a recent office visit I thought about those persistent low grade fevers and suggested we repeat a blood smear (a prior one many months ago was negative). A photomicrograph is included here. Discussion: Did she have Lyme? I am frequently asked, can you just have a coinfection, like Babesia and not have Lyme. This is certainly possible but seems unlikely. A large percent of the population is silently infected with Babesia species. My sense is that the compromised immune system of Lyme tends to make Babesia more active and symptomatic. Usually you don’t get one with the other (probably others as well). I have relied heavily on Lyme Western Blots, C6 ELISA tests and clinical judgment to diagnose Lyme. I have not used the ISpot which I thought was too nonspecific. This test measures interferon responses of killer T-cells when provoked by specific Lyme antigens. The ISpot may be useful, especially when other tests yield negative results. No commercial tests are available for other common Borrelia species which I believe are more and more responsible clinical Lyme disease, Borrreliosis. Alternative Lyme species (like B. lonstari) may be tested by PCR but this is a low yield test. Standard Babesia tests, antibodies for B. microti, B. duncani and FISH tests may detect only 2 species of Babesia; there are an untold varieties of Babesia which hold clinical importance. The CDC recognizes the existence of at least 3 other species of Babesia causes disease in the U.S.: B. CA1, B. MO1 and B. divergens. Countless species are known to cause animal illness (more than 100) and many non-speciated varieties of Babesia have been found in local ticks using broad DNA/PCR probes/primers. 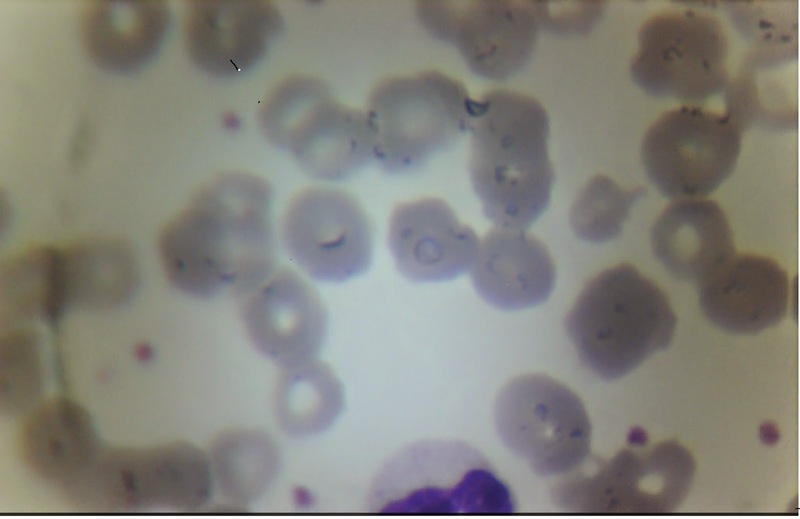 I am fairly sure that there are many, yet unknown, species of Babesia associated with human disease.I think the blood smear above is consistent with this phenomenon. A lot is known about the 5 common species of Malaria including distribution patterns and drug resistance. These facts well known by organizations including: IDSA, CDC and WHO. This is not to say that Malaria is not one of the largest, if not the largest public health problem in the world. It is said that Malaria has been eradicated in the US; still, about 2000 cases are reported to the CDC each years, mostly for foreign travelers. In 2013 the CDC states that 1700 cases of Babesia from 27 states was reported. From this data one can infer the CDC thinks we have no Babesia problem. This tremendous epidemic of human babesiosis of unimaginable proportion goes completely unseen by the CDC and Mainstream Medicine. One reason may be its association with the four letter word: (Lyme) – guilt by association. This unknown epidemic, of which we know very little, is wildly out of control and ravaging the health of patients I see daily. Babesia, a blood parasite, is also a brain parasite. It is carried into the blood on the back of red blood cells, called the Trojan horse effect. The parasites are carried into tiny blood vessels where they become impacted and fixed. Brain parasites are mysteriously associated with reliably specific symptoms. Toxoplasmosis suicide and car accidents (published). Babesia depression. Bartonella irritability and rage. The mechanism may be specific effects on molecular signalling in the brain. Action at a distance. Bartonella enters the brain by the same mechanism. Bartonella is not limited to blood cells, it also invades the lining of blood vessels, endothelium, taking up residence. My comments here are about Babesia. Babesiosis is frequently intractable. It is resilient and becoming increasingly resistant to our standard drugs. Mepron is frequently ineffective. Malarone may work only a little better. Coartem seems to be more effective but it usually fails to eradicate the parasites. We add herbal remedies, artemisinin and a triple concoction recommended by Buhner. The parasites persist. Larium has been effective but side effects (depression) have frequently been intolerable. Babesia patients are depressed to start with. Recommended doses of quinine are intolerable. I have tried adding low doses of quinine adjunctively which seems to help some. The antiparasitic drug albendazole has anti-malaria activity and can also be helpful adjunctively for babesiosis. Babesia relapses are notorious. The classic knee-jerk symptoms I always look for are night sweats and air hunger. Other common symptoms include muscle pain, headache, mood swings and depression. The depression seems to have a propensity for causing sudden tearfulness. A plethora of other symptoms may be associated with Babesia, include chronic, low grade fever. This seems to be relevant to the patient described above. Babesia brain Herxheimer reactions are frequently dreadful and very challenging to manage. This patient, as so many others, experience palpitations and other cardiac symptoms. I will explore this topic in my next post. The majority of chronic Lyme patients suffer with some degree of cognitive dysfunction. The term “brain fog” is commonly used. Patients don’t feel as sharp. It becomes difficult to think clearly. Short term memory and working memory are poor. Finding words, completing sentences becomes difficult. Patients feel like they have the sudden onset of ADD (attention deficit disorder). Patients frequently experience disorientation and confusion and a long list of other symptoms. It has been suggested that all patients with “neuro-lyme” should be given IV antibiotics. This is not realistic since most patients have brain symptoms. Spirochetes may cross the blood brain barrier within days of infection. icture and must be dealt with separately, in specific ways. Cognitive changes may correlate with white matter spots seen on brain MRI or with poor blood perfusion on nuclear medicine SPECT scans. Cognitive symptoms for the most part are due to inflammation, not permanent structural damage; so, in most cases, these symptoms are reversible with appropriate therapy. In most cases I like to start with oral antibiotics, ones that are effective against the pleomorphic forms of Borrelia (round body forms and others), and ones that pass the blood brain barrier. I will talk about treatment in a subsequent BLOG. Unfortunately many patients get worse with treatment: we refer to this as a brain Herxheimer reaction. The best thing to do may be to hold antibiotics for several days and then restart at a lower dose, as tolerated. Intravenous glutathione, (only IV), and I have tried all other forms, liposomal, oral, intranasal and even rectal is the only form that works. Glutathione (GTH) when it works, can seem like magic. HBOT, hyperbaric oxygen therapy can be very effective. I have also found that Welchol works for some patients. Welchol is interesting. Being in the field (of chronic Lyme doctors), early on I was told that Welchol and related drugs remove biotoxins. This is plainly incorrect. The important biotoxin, quinolinic acid (QUIN), does not cross the blood brain barrier. QUIN binds to NMDA receptors, it promotes action of the neurotransmitter NMDA. Drugs that antagonize NMDA are well known to many. These drugs include phencyclidine (angel dust and others). In the Lyme brain the opposite is happening. Excessive activation of NMDA receptors causes (glutamate-excito-toxicity) with increased cell death, associated with a wide spectrum of neurodegenerative disorders, including Alzheimer’s disease. It turns out that bile acids, thought to be detergents to emulsify fat have neuro-regulatory function. Cholesterol also has neuro-regulatory effects. Welchol may help neuro-inflammation by unanticipated mechanisms. Other drugs which help moderate the effects of QUIN include the mood stabilizer Lamictal and the Alzheimer’s drug Namenda. Both have a role in the treatment of QUIN toxicity. It is perfectly OK to treat symptoms as the patient heals. A word of caution with depression: SSRIs, typically used for depression may have a paradoxical effect in the “Lyme brain.” Lamictal, discussed above may be effective. Also, Wellbutrin may be better tolerated. Stimulants are very effective for ADD symptoms as well as for fatigue, including: Ritalin, Adderall and others. Although I do not like to start with IV antibiotics, if patients show no improvement after 4-6 months, and I am sure the diagnosis is correct, it is time to consider IV antibiotic therapy. The second-most disabling symptom experienced by Lyme patients is pain. Lyme patients of all kinds of pain. Frequent the pain confuses physicians because it is migratory and transient, here one day and somewhere else the next. This is paradigm busting. Lyme patient may describe the pain in ways which sounds strange. Pain is subjective and very difficult to describe. Chronic pain is extraordinarily common in our country. I was surprised to read that is estimated that 40% of the entire country suffers with some form of chronic pain. Interestingly, the incidence of chronic pain is extremely variable in other countries ranging from 10% to 50%. Pain, not unlike fatigue, is a brain disorder. MRI changes with a loss of gray matter are seen patients with chronic pain. These changes reverse when the pain resolves. In standard medical literature it is said that chronic pain rarely resolves. That has not been my experience. The question is: why does Lyme hurt. For a start, Lyme spirochetes have a unique ability to infect nearly every tissue in the body. The germ is poly-tropic (can go anywhere) and patients are pan-symptomatic (experience multiple, seemingly unrelated symptoms found in many publications). Pain comes from skin, peripheral nerves, central nerves, viscera and organs, tendons, ligaments, muscles, joints, head and simply from the brain itself. Generally the cause is inflammation, directly from invasion of the involved tissue or from an autoimmune processes. Pain is frequently associated with structural/physical damage to the involved tissue. The damage may only be seen with nuanced studies of which the general medical community is ill informed. The severity of pain and the quality of pain vary tremendously and can be difficult to describe. Traditionally, Lyme has been seen in association with joint pain and arthritis, meningitis and carditis and several others. Mainstream medicine has failed to recognize the connection between numerous chronic pain syndromes and Lyme disease. Certain coinfection syndromes are associated with specific pain. For example Bartonella as well known to cause heel and shin pain. This will but not be my focus here. Patient do have variable tolerance to pain for variety of reasons. This will not be my focus as well. Physicians as a whole are poorly informed about pain and chronic pain and tend to be dismissive of patients complaining of pain. When brought up in the context of Lyme disease pain complaints are received with even less credence. Many Lyme patients are diagnosed with fibromyalgia. There has been a long-standing debate amongst physicians. Is "fibro" a real disease or simply a garbage can diagnosis? The disease is real. Medical research shows there are path-anatomical changes in the muscles and small nerve fibers in these patients. The physical examination is patients is clearly abnormal. I consider fibromyalgia a syndrome, not a disease. Lyme and associated infections may be the root cause in many cases. Chronic pain patients are frequently told they look fine, not showing any signs of pain. This is how chronic pain patients appear. Pain which is unrelenting, day in and day out is torturous and unbearable and yet patients may look "fine." Physicians should give their patients the benefit of the doubt and assume their patients are telling the truth unless proven otherwise; it is only a small percentage patients who inappropriately seek drugs. A pain management specialist told me that typically 20% of patients seen in his practice are drug seekers not suffering with pain and that this breakdown is typical for other pain practices. Why then, do physicians think the 80% of patients suffering with pain should be made to suffer an unbearable fate because of the 20%? Please treat your pain. Chronic pain has adverse effects on sleep, mood, neuroendocrine function, functional capacity and impedes the overall healing process. Some Lyme patients live in chronic pain refusing to take opioids because they have the incorrect notion that use of opioids will suppress immune function and their ability to heal. This is not true. Let's talk about headaches. Neurologist infuriate me. They are married to the notion that headaches respond to standard drugs like: Imitrex and Topomax; I’m sorry, but the brain/head forgot to read the textbook. Neurologist and headache specialists are obsessed with the idea that migraine/chronic headache patients will respond to their standard drugs. Narcotics are not prescribed because the patient will become addicted or abuse the drugs. Desperate patients go to the emergency room are almost universally looked at suspiciously. These poor souls are seeking a modicum of relief from pain that makes the sufferer want to tear off his/her head or commit suicide. This no-narcotic sort of thinking is outdated and criminal as far as I’m concerned. In the early 80s I was taught that Narcotics were only to be given to patients with terminal cancer because of addiction. In the 90s the pendulum swung the other way. Physicians were instructed to compassionately treat pain; clinical studies showed that few patients developed addiction. The pendulum has swung back the other way because the DEA is obsessed with OxyContin abuse and able to look at the big picture. This obsession has led to a sudden increase in deaths from relatively inexpensive, apparently no longer stigmatized heroin. New onset daily migraines and new onset chronic daily headaches are new phenomena. Lyme, Babesia and Bartonella are frequent contributors. Any treatment that works is OK. Therapies such as chiropractic manipulation, botox, HBOT, and possibly oxytocin can be tried. Ultimately, opioids may be the only thing that works. Patients should be their own advocates and do whatever is necessary to attain a quality of life higher than zero.If their pain doctor does not get it find another who will. They exist. Lyme arthritis can be challenging. Patient seeking my attention usually suffer with long-standing, intractable joint pain. Many of these patients only improve with very aggressive therapy. Borrelia spirochetes are anaerobic and drill shaped; the bacteria utilize these attributes to invade deeply into synovial tissues and cartilage. Joint pain can be the only complaint making these patients different from typical, poly-symptomatic patients, and therefore, physicians, including like-minded colleagues, avoid intravenous therapies. However, intravenous antibiotics may be the only treatment that works. Long courses sometimes five months or more of intravenous antibiotic therapy is required. Oral drugs lack the power to penetrate cartilage which is largely avascular. When hard earned remissions occur, maintenance oral therapies are necessary. I have found that the combination of doxycycline and Tindamax is usually effective. I recently saw a refugee from a rheumatologist who was misdiagnosed and pumped her with a panoply of biological agents which caused a severe exacerbation of joint pain. Lyme arthritis may have different faces at times appearing much like rheumatoid arthritis and other forms of arthritis. Plaquenil and sulfasalazine, anti-inflammatory, immune modulating drugs may occasionally be helpful and are safe to use. Steroids should generally be avoided. Lyme arthritis can look like and act like osteoarthritis. When all the cartilage has been chomped through by spirochetes, bone on bone is all that is left. Surgery may be needed. Hyperbaric oxygen therapy can work wonderfully for some patients. Patients may try low dose naltrexone but in my experiences it rarely works for chronic pain. Sometimes, drugs like Cymbalta and Lyrica are effective. Medical marijuana, available in some jurisdictions, is a new player. For some it is very effective. Alternatively, synthetic THC, Marinol can be and work well. I saw patient today suffer with Lyme arthritis was has been taking liposomal doxycycline. He feels it has been somewhat effective. In my clinical practice I have not seen much difference between standard doxycycline and liposomal doxycycline. In theory, liposomes avoid destruction by gastric secretions, have better absorption and have higher bioavailability. In addition, the chemistry of liposomes allows them to bind directly with the cell wall or membrane of bacteria significantly enhancing the efficacy of the drug. If narcotics are the only thing that works, take them. Neuropathy pain is extremely common amongst Lyme patients. I have found the vast majority of my patients suffering with chronic Lyme show some evidence of peripheral neuropathy, damage to small sensory and motor nerves. In most cases the EMG/NCV is negative. Frequently, small fiber neuropathy may be demonstrated from skin/sweat gland biopsies. A physical examination can be revealing, especially testing sensation in the lower extremities with a tuning fork. Nerve pain can be excrutiating. Patients with severe neuropathy syndromes can respond dramatically with the use of IViG. Different types of pain of various causes may respond better to one therapy or another. For example, a nonsteroidal anti-inflammatory drug may be helpful for joint pain but provide no relief for nerve pain. The opposite is true for drugs like, Elavil, Lyrica or Neurontin. Ultimately, every effort should be made to control pain using appropriate medications and ancillary therapies. For the vast majority patients pain can be controlled and should be controlled. This is a necessary part of treatment.